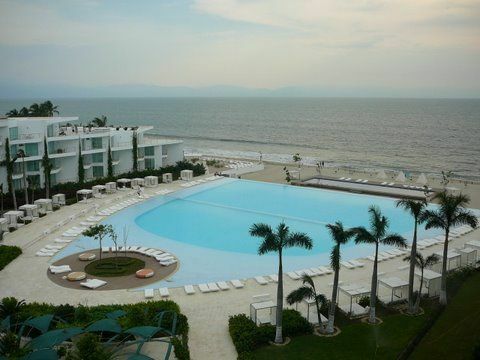 Acqua is on the beautiful 6 mile beach in Nuevo Vallarta. Our condo is on the 5th floor facing the pool and ocean. We have 2 balconies, one in the living room/ kitchen with great views and the other is off of the bedroom with the same great views. obtain the access code to the condo. to enjoy it.On the negative side is the constant noise from the construction site what will be a new 160 condo project.But word has it completion is scheduled by year end. Teresa was helpful in many ways and also provided an umbrella,,BBQ gas tank as well as additional cooking pots at our request. As an aside,a telephone and Alarm Clock would have been useful.The weather was great and overall,we had a good time. Thank you for your comments on your stay in our condo. Teresa is usually very prompt. I will address this with her. But I am happy to see that see attended to your needs. The view is spectacular and I also enjoy sitting on the balcony looking at the bay and pool. Enjoyed our stay at this condo. We liked the condo and the views. We had a couple of issues however Joann was fantastic about rectifying them right away. We would definitely stay there again. Thanks to Joann for a positive experience. Ps. Only recommendation would be to have fans installed so we wouldn't have to use the air conditioning. Nous avons particulièrement apprécié le fait que le condo est ouvert sur l'extérieur. Les panoramas de la piscine et de la mer sont merveilleux. La lumière naturelle fait du bien aux nordiques que nous sommes.